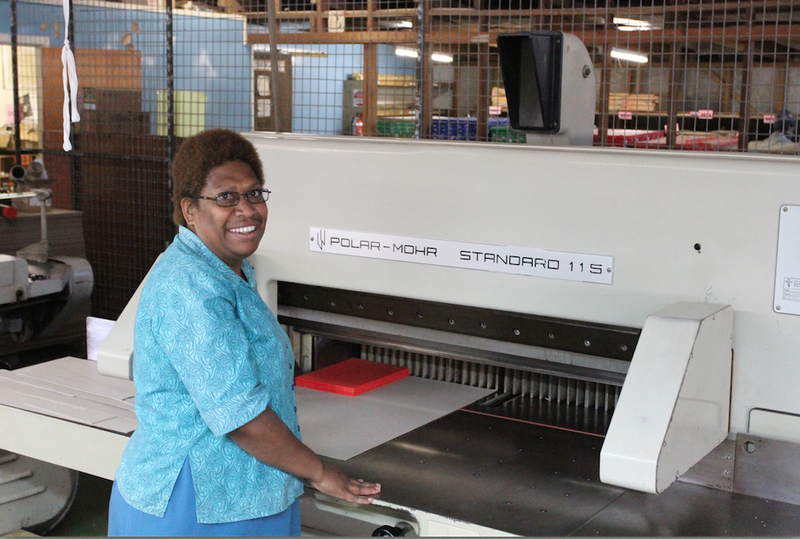 JoAnne, a Kuanua speaker from Rabaul who is a compositer/printer by trade, first came to work in the Ukarumpa Print Shop in 1989. At the time, JoAnne didn’t know anything about [Ukarumpa] or Bible translation. “I just thought, well, I can try it out…and I’m still here!” She laughed at the memory. Not only does the Print Shop produce Scripture portions, literacy books, and hymnals, but they also create much needed items like certificates, receipt books, passport photos, letterheads, invoices, record books, textbooks and much more. Their reputation of high quality work also brings in commercial jobs from around the country.